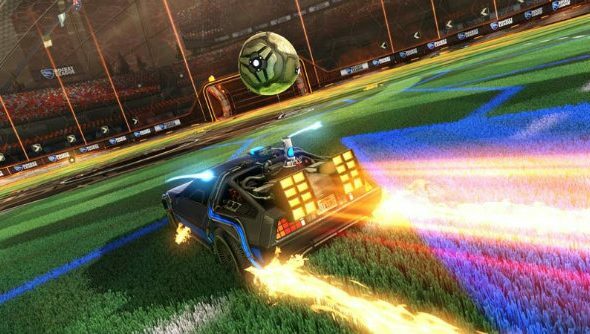 On October 21, 2015 – the same day that Marty McFly traveled to in Back to the Future, Part 2 – the DeLorean time machine will come to Rocket League as a playable Battle-Car. Still not sold on rocket-powered car football? Check out our PC review of Rocket League. It’s incredible that an indie game about cars playing football has become so popular. I don’t think anyone would have bet on its success back when it was announced, but now Psyonix are partnering wih Universal Studios and making waves in the eSports scene. It’s lovely to witness. Being fans, Psyonix worked hard on recreating the classic feel of the vehicle, complete with folding jet wheels and a ‘burnt rubber’ rocket trail. If you want it, the car DLC can be yours for $1.99 or your local equivalent.